The thing about toy pianos is this: they’re scary. Just like a playground at midnight with one empty swing moving; or a rocking horse in a dusty, forgotten nursery suddenly creaking against the floorboard; or the doll whose eyes follow you from across the room. 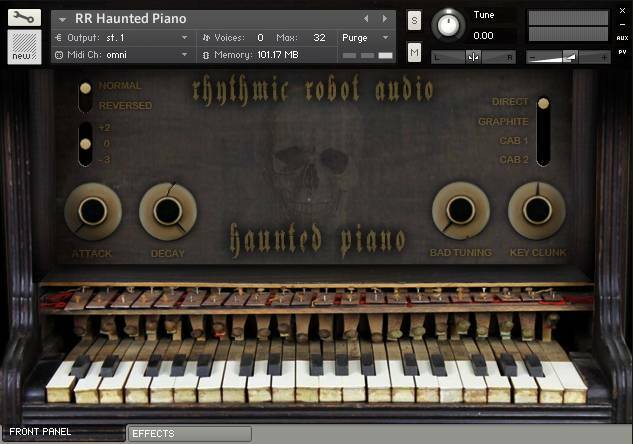 Haunted Piano is created from multiple samples of two toy pianos which between them span a full three octave range. We sampled them at midnight, by candlelight, when the moon was full (and at 24-bit, natch). Using three velocity layers and two round robin sets, we created an eminently playable and responsive virtual toy piano, which can sound just as clunky and naive as the originals. But then we went a bit further down the spookiness path, pushing the sound of the virtual instrument into sound-design territory. The samples can be reversed with the click of a button, to give eery builds and surprise tones, or to recall those “backwards masking” moments so favoured by demonic rock bands. They can also be force-transposed down by three octaves for groaning, bottom-of-the-sea, sepulchral noises and cavernous drones; or pitched up two octaves for tiny, sparkling fairy-bell sounds that glitter and gleam. The base sound covers a five-octave span in the middle of your keyboard, the middle three octaves of which are chromatically sampled. But the fun doesn’t stop there. At the top of the MIDI key range we’ve crammed in 75 further sounds made by the toy pianos under duress – when we tipped them over, shook them, dropped them, creaked their lid hinges, rattled their keys or otherwise abused them. These sounds are mapped across two octaves and three fixed velocity layers for easy access within your DAW, and comprise a wide range of effects noises, sound-design starting points and other sonic goodness. They, too, can be force-transposed down or up, allowing them to be used as everything from apocalyptic thunder sounds to splintery little percussive details. Attack and Decay controls allow you to mould the base sound a bit, while Bad Tuning does what it says on the knob and lets you add a touch of drift or a full-on dose of threatening unpleasantness for cacophonic, atonal moments. Key Clunk controls the level of the 50 key-off samples, which are selected randomly and which add a great degree of realism to the sound. The rear panel offers up two specially selected effects: echo (which is, of course, the scariest of the effects groups) and reverb (for getting that dark-mass-in-the-cathedral-crypt spaciousness to the sound). On the front panel, meanwhile, you can switch between two amp cabs and a convolved graphite microphone to change the colour and tonality of the sound. The graphite mic in particular sounds excellent on this instrument – you can see it in the photo above and hear it on the demo track in several places. I’m not afraid as long as I don’t stop playing. It’s Spooky, it’s scary, it’s Haunted Piano. What we have here is a fun little instrument that is more versatile than it first seems. Based around toy pianos, you not only get that traditional toy piano sound that is loved by children and feared by cringing parents all over the world, you also get the opportunity to creep the neighbours out, by mangling the sound into something other-worldly. The controls you have at your disposal, gives you a respectable range of sound sculpting ability and you can go from traditional “plinks” and “plonks”, right through to full on demonic possession. Switch on the “Reverse” option whack up the Reverb and the Delay and you can take this to a whole new and spine-tingling level. RRA have made something a little bit special. 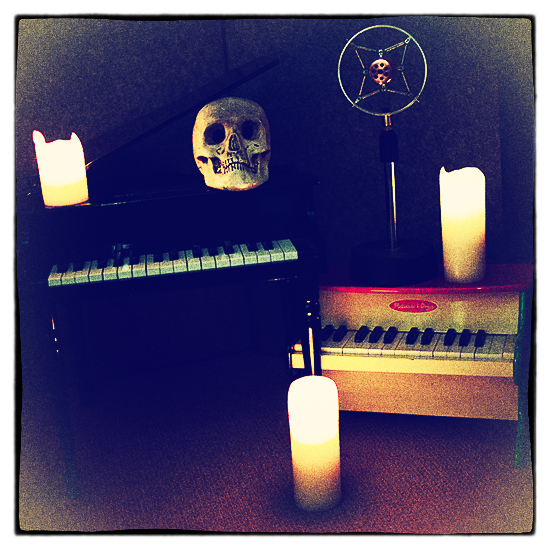 I’ve used a few toy piano libraries over the years and while they successfully capture the typical toy piano sound, Haunted Piano’s little “extras” give far more scope – it’s also much more fun to play. From Yann Tiersen* to John Cage**, from angelic to apocalyptic and from the nursery to the caverns of the underworld, Haunted Piano has you covered. Versatile, from crisp icicle sounds to murky scapes. You need a toy piano, of course you do, but what you didn’t know is that you need a haunted one. This is that. An extremely eerie sounding instrument that would be perfect for a horror soundtrack, and just when a freaky piano sound is needed. Sounds great. A very versatile toy piano. Selecting the graphite mic and turning up the bad tuning knob you can recreate a perfect dark carnival atmosphere, especially if sometimes you hit randomly the keys in the upper octaves where are mapped the special effects. And, with the ultra-low pich shift setting, the sounds remind a kind of distorted tower bells… well done! Disturbing. You think you are playing a child’s toy but it turns out to be one that is posessed. Do not play it at night when you are alone. I recently had a couple of different Halloween-themed projects I had to do. ONE instrument (out of ALL of the libraries, plugins, etc. I own) made it into BOTH projects, and this was it. If you just imagine the ideal, creepy piano-type sounds in horror movies, or other “scary” settings (like haunted houses, or whatever) , THIS IS IT. Dark, intense and eerie. Super fun and quirky. Sort of like a fistfight in a toy store. This little thing is stupid fun!! Tune it down, turn down the lights and freak out! Equal parts nostalgia and an exploration into the paranormal, Haunted Piano lives up to its name in this wonderfully macabre instrument. This is one of the first Rhythmic Robot instruments I purchased, being a big fan of the “Burning Piano” patch in Spectrasonic’s OminSphere. Playing Haunted Piano can lead you down some disturbing musical paths (especially if you engage the “reverse” feature), but in a satisfying and entertaining way reminiscent of your favorite horror film. You won’t be disappointed.